An opossum’s ideal habitat is cool, dark, and easy to access, if food is readily available, as well, then the area is even more appealing to them. With this information in mind, it’s no surprise that possums frequently “set up shop” in the crawl spaces, attics, basements, decks, porches, and tool sheds until they are removed! A particularly clever possum might even learn where you keep your trashcans or pet’s food bowl and help itself to an all-you-can-eat buffet! Trouble arises when the nocturnal opossums keep you up at night with their constant movement and activity. They also leave waste around that can smell terrible, damage a building’s structure, and pass diseases on to humans. And, of course, if a possum dies somewhere inside or very near to your home, it can be extremely unpleasant for everyone involved. No doubt about it: if you’ve become the unwitting (and unhappy) host of an opossum on your property, then you’ll want to “give it the boot” as soon as possible! Feces in your attic, garage, shed, or yard. Droppings from a healthy opossum vary in color from red to dark brown, but typically resemble cat feces. 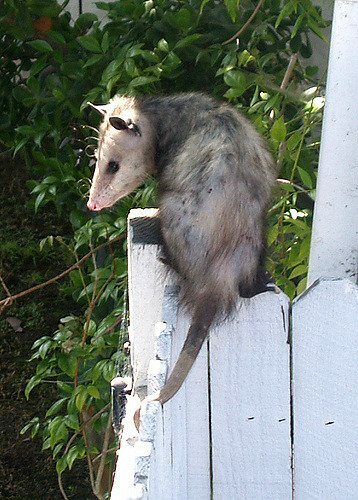 The opossum may also relieve itself on your porch, deck, rain gutters, outdoor furniture, or veranda railings. Scratching, running, or jumping noises coming from inside your walls, attic, roof, or chimney, especially during nighttime hours. A foul odor permeating your home. This smell could be coming from the opossum itself or rotting food that it has in its nest. Damage to your home’s exterior walls, roof, or deck. Household dogs and cats exhibiting agitated behavior. Be especially wary if food keeps disappearing from their outdoor bowls. Trash cans constantly being raided or knocked over. Opossums are expert climbers, which means that they have very little trouble scaling the sides of human houses or getting up onto roofs. Once there, they exploit existing gaps in the structure or just create new ones with their teeth and claws. Vents and crawlspaces are frequently targeted by opossums, as are areas of damaged wood or brickwork. Uncapped chimneys can be vulnerable, too. And some opossums have even been known to simply wander in through unsecured doors! In North America, there’s actually no difference between the two. “Possum” is simply a colloquial way of saying “opossum”; by eliminating the first letter, a speaker can shorten the word by a whole syllable. That said, there are animals known as possums in Australia, and they’re an entirely different species from American (o)possums. Both are marsupials, but that’s practically all that they have in common—they don’t even look similar to one another. Yes, they will, and it’s actually a pretty unpleasant sight to behold. It’s also very convincing, which means that many folks who think that they’ve found a “dead” opossum on their property have actually been fooled by a live opossum. For a more detailed explanation of this behavior, please refer to this blog post. Regularly inspect the exterior of your home (including the roof) and other outdoor structures for holes. If you find one, either plug it with steel wool or patch it with proper building materials. Make sure that your outdoor trash cans have tight, secure lids. Bring bowls of pet food inside at night, or stop leaving food outside altogether. Remove tall grass, piles of brush, and other debris from your yard. These kinds of hiding places are attractive to opossums, so having them around may encourage the animals to come inspect your house. Consider installing motion-activated lights or sprinklers in your yard—such things will often startle or annoy opossums into avoiding your property. For opossum removal in the Dallas, Fort Worth, and Houston areas, look no further than Chimney and Wildlife Specialists. We’re a BBB-accredited, award-winning company that utilizes humane, safe, and cutting-edge techniques to help homeowners get rid of pests. All of our specialists are certified, insured, and well-trained, so even the toughest jobs can be done quickly, efficiently, and affordably. We’re locally owned and operated, and in many cases, we offer same-day, emergency animal control services to help with opossum trapping and removal. If obnoxious opossums are causing you to lose sleep in Dallas or Houston, then don’t delay—contact Chimney and Wildlife Specialists today!